image via kal barteski - so much talent. be sure to check her out! It would be ridiculous of me to think that I am ever going to be done growing. I completely understand this huge concept - the only guarantee in life is change and that includes us, growing and changing as human beings. I get it. But I get it so much more now that I am a mother. Things have changed for me so much in the last 5 and a half months - it's crazy. And I was so beyond ready for that change. I turned 35 in February and I have heard that (women especially) we have an itch to evaluate and change/improve our lives every 7 years (ever heard of the 7 year itch?!) so I am right on schedule. Now that I am a mother, I am thinking more and more about the person I am, and the person I want to become over the next few years. What kind of a woman do I want to be for my daughter to look up to? What kind of things do I do now that are not the best decisions that need to change? I find myself questioning everything about myself - my appearance, the way I talk, my body image, what I do with my time, what I want to do as a career, my friends, my family - the list goes on and on. Self reflection seems to be the name of the game right now in my life. I know that I don't need to change. I am great just the way I am - we all are. 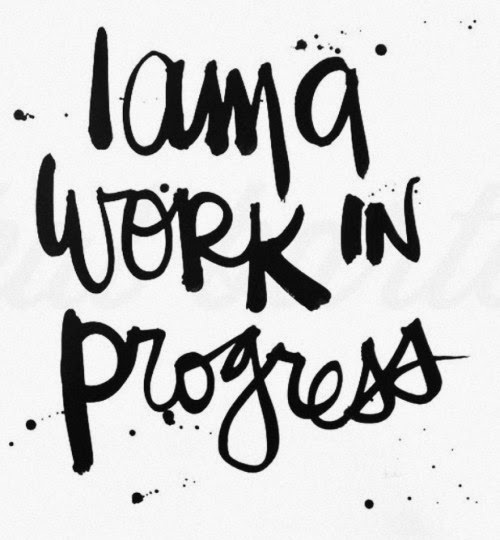 But I also recognize that I am a work in progress and change is inevitable so why not pay attention a bit on work on becoming the best ME I can be for myself, my daughter and our family. Speak Less - Bottomline is I open my big, fat mouth way more than I should. I engage in conversations I shouldn't, I add to stories when I shouldn't and I provide way more detail than I need to. Some things are much better left unsaid and I think if I keep this in mind, I can clear myself of any gossip or wasted words. I just need to keep some stuff to myself - and do it way more often. Look Into People's Eyes - I don't know when I developed this awful habit because I know I haven't always done it but over the past few years I have noticed that I very rarely look into someone's eyes when I am talking to them. I am 100% engaged in the conversation and am honestly listening, but I am sure that the person I am speaking with thinks I am not paying attention. I don't know why I do it but when I notice I am doing it, I feel embarrassed and disrespectful. Must make eye contact more often. Say "Yes" and not "Yeah" - I have noticed this for a while now but even more so now that I am a mother. I use a lot of slang in my every day dialogue but one of the worst is when I answer someone with "Yeah" instead of a full "Yes". I am already telling my daughter (just shy of 6 months) to use the full word YES! I am sure I will continue saying yeah all the time but am much more aware and can at least correct myself for my daughter's sake. It's so tacky in a lot of situations to say, "Yeah" or "Yep". Did you experience the 7 year itch phenomenon and if so, did you do anything about it or just ride it out and let life do it's thing? I love that you brought this up. After giving it some thought I realized at this moment right now in my life I am happy and not ready to work on any self improvement. I love that you have this itch though and shared the areas of your life you want to work on. I hope you succeed and I look forward to hearing about your wins! Self-improvement is really a big part of life isn't it. Thank you for your comment Krystal. I find my "life musing" blog posts are all over the map and more of a journal or notes for me personally so I can be reminded of what I am focussing on. Update posts help me keep accountable to myself too so if nobody reads them, I do :) Thanks again!